Piara Singh Sambhi was a prominent member of the Sikh community in Britain. He took a leading part in the development of the Chapeltown gurdwara in Leeds and became its president in 1967. He wrote several books, including The Guru Granth Sahib, which was published posthumously in 1994, and Understanding Your Sikh Neighbour. Owen Cole has written widely on Religious Education as well as Sikhism. The last book which he and Piara Singh wrote together was Sikhism and Christianity. This second edition of The Sikhs is an indispensable, comprehensive and reliable guide to anyone with an interest in the Sikh religion and community. Sikhism is increasingly capturing the attention of students and scholars of history and sociology, as well as religion. All major aspects of the religion are covered: its history and development, the Sikh scriptures, worship, ceremonies and festivals, religious thought, daily life and ethics. A superb multi-dimensional introduction to Sikh thought and practice… this brief yet thorough work on one of India’s most important religious groups should be found in every library. It is an important book and there is nothing like it in the field. 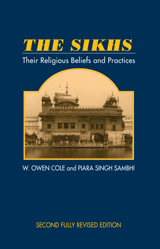 I have used it on my own courses on Sikhism in Columbia and students enjoyed reading it.